Get some cute free Easter crochet patterns when you download this FREE eBook. Crochet your own pillows, Easter baskets, bunnies and more! Home > Seasonal Crochet > 100+ Free Crochet Patterns for Winter: Free Crochet Hat Patterns, Scarves, Blankets and More! Are you feeling knotty? Do you fall into stitches at every turn? Do you bobble and weave when you think of your favorite hobbies? If so, you have found the ultimate source for all your crochet needs! This collection features the Top 100+, the crème de la crème, the magnum opi of the free crochet patterns for winter from AllFreeCrochet.com. In this list, you’ll find everything from crochet baby hats to crochet gift bags, free crochet scarf patterns to easy crochet mittens. 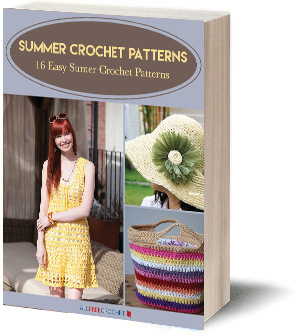 This list will accommodate anyone regardless of their level, because it includes beginner crochet patterns as well as more challenging projects. When the winter winds drive you indoors, you have the perfect excuse to begin all of the free crochet patterns you’ve wanted to start. Chilly months are the perfect time to sit and relax with a heartfelt project like free crochet hat patterns and free crochet afghan patterns. Whether you want to create a heartfelt gift for a friend or an accessory for yourself or a family member, these winter crochet patterns are perfect for every occasion. Keep your digits dancing and your fingers unfrozen with these easy crochet mittens, gloves, and arm warmers. Learn how to crochet gloves and mittens as gifts for your friends and family or keep them as personal accessories. This collection contains mittens for everyone, from babies to grown-ups and everyone in between. Free crochet patterns for winter are already great, but they are even better when they can be made for everyone in the family! In order to properly optimize brain function, your head must be toasty and warm at all times. It doesn't hurt to be fashionable and stylish at the same time! Put your head at ease with the free crochet hat patterns listed below. You can make a hat for yourself in any style, or give the gift of warmth to a friend. These free crochet afghan patterns and throws are bundles of fun. Wrap up the little ones to keep them nice and comfy or just relish in the lovely accent pieces you worked up yourself for your favorite furniture. Crochet afghan patterns are perfect for winter because you're guaranteed to keep warm and toasty all season long. These might even introduce you to some new crochet stitches; take a look for yourself! Maybe you don't want to wear a hat this winter because you hate hat hair with a passion. However, your ears are still begging for some warmth without one! Try these crochet headband patterns that will be sure to keep your hair out of your face and your ears warm in the blistering cold. They add a little bit of flair to an outfit without being obnoxious, covering your face, or flattening your hair. Before going out to enjoy the great outdoors, one must be properly prepared for the elements. Fend off unfashionable winter shivers with these lovely handmade scarves. These free crochet scarf patterns will keep your neck nice and warm, as well as display your innate and perfect fashion sense. You can find every type of scarf you are looking for here: regular scarves, crochet infinity scarves, and cowls. Try one out for the perfect fashion statement this season. Whether you're indoors or outside, layering can be ideal during any month of the year. You should definitely try making these stylish and soft sweaters and crochet shawl patterns to keep yourself warm whether it's blustery outside or they just have the air conditioning cranked up in the office. Once you’ve made one, you can toss it into a tote for later or don it immediately for a perfectly fashionable and incredibly functional article of clothing. Keep one on the back of your office chair so you never have the shivers indoors. One of the trendiest winter fashions is the boot cuff. Now you can make your own with these crochet boot cuff patterns that keep up your style and add a little bit of extra warmth. Don't let the blustery winter cold get inside the little crack at the top of your boot and make your feet cold all day. You can easily avoid this by working up any one of these stylish and fabulous boot cuff patterns. Nothing is quite so endearing as baby fingers and baby toes, but those little digits are more susceptible to the chill. These crochet patterns for the tiniest members of your family are perfect for keeping little fingers and toes warm and wiggly. Make free crochet patterns for babies so that the little ones can stay warm all winter long. When the winter season comes around, that also means it is time for the holidays. If you are not a big fan of spending money just to buy a gift bag, try crocheting one instead. This list is full of gift bags and crochet basket patterns you can work up so that you have a place for your gifts or can give big baskets of multiple little things put together. What's your favorite winter weather activity? Need to understand what the cl instruction means in the Comfy Cozy Headband pattern means - please and thanks. Cl stands for cluster stitch. you can go to your browser put in crochet cl and you can learn how yo do a cluster stitch. I printed out the comfy cozy headband pattern and cannot understand what the cl means in row 2. I only printed out the first page - is there an instruction I am missing? Please and thanks. Hello dear Staff ? AllFreepatterns. I have been coming on this site now for a long time and never wanted to put any comment in? - BUT - I have now. Please, please - how can I download all these "100" patterns in one go? and I could look at it in my own time?? Just like you have the E.BOOKS - it would be so nice. Having each patterns individually? it could take a long time. Anyhow - I do like to look at them - some time and pick out on my downloaded patterns when I need it. If I just going to take a few now? I have lost the whole lot and can not go back to it. Please DEAR STAFF? HELP WITH THIS - PLEASE? I am very grateful for all what you are doing for US to enjoy the patterns, at our leisured time. Thank you again for your kindness. Wishing all my very best to YOU ALL. When I find a pattern I like I pin it to my Pinterest board for crochet. Then it is easy to find and bring up. It doesn't solve the problem of wanting to download in bulk, but it does place the patterns you are interested in in a convenient browsing location with pictures. I am currently looking for winter scarf patterns that are not bulky and do have some patterning. So far I have not found any, but have found patterns for other things that I may try to do as a scarf. I put them all on my Pinterest board so I don't have to print or download them before making a choice. I love all the free patterns. Thank You. Is there a free patter for a hat and scarf in the crocodile crochet? I would like to learn this.. In the past if I couldn't get a pattern to print, I would email it to myself , then print it out. Hope this helps! I have been look for this one pattern and can't find it. I need it to be online pattern; because it's not my computer. pattern is 24 point ripple afghan. I'd like to make a dish cloth. Where can I get the instructions for it? Fave-craft is where I got the pattern. Here is the pattern from Ladynell 75 Materials: * Lily Sugar n Cream (Solids: 70.9 g/2.5 oz/109 m/120 yds) (Ombres: 56.7g/2 oz/86 m/95 yds) (00165 Daisy Ombre) 1 ball * Crochet Hook: Size 5 mm (U.S. H or 8) crochet hook or size needed to obtain gauge. Gauge: 13 sts and 12 rows = 4 ins [10 cm] in pat. Size: Approx 13 ins [33 cm] square. Instructions: Ch 44. 1st row: (RS). 1 sc in 2nd ch from hook. 1 sc in each ch to end of chain. 43 sts. Turn. 2nd row: Ch 1. *1 sc in next sc. 1 tr in next sc. Rep from * across to last sc, pushing tr to RS of work. 1 sc in last sc. Turn. 3rd row: Ch 1. 1 sc in each st to end of row. Turn. 4th row: Ch 1. 1 sc in each of first 2 sc. *1 tr in next sc. 1 sc in next sc. Rep from * across to last sc, pushing tr to RS of work. 1 sc in last sc. Turn. 5th row: As 3rd row. Rep 2nd to 5th rows for pat until work from beg measures 13 ins [33 cm], ending on a RS row. Hanging Loop: Ch 10. Join with sl st in last sc worked. Fasten off.